I am not, as a rule, a big fan of flavoured coffee. Actually that isn’t strictly true – it’s just that I always steer clear of flavoured coffee beans. I’m not entirely sure why this is the case; my drink of choice in Starbucks (yes, I like Starbucks – I accept this may have invalidated anything I ever say about coffee) is a Vanilla Latte, and the greatest thing about Christmas in my book is the arrival of the whipped-cream-topped Gingerbread Latte. So it’s not the added flavour that I dislike, as such (although a flavoured Starbucks latte has about as much to do with coffee as Nescafe Instant does) – I suspect my distrust is based on experience. All my previous flavoured coffees have been of the “last minute gift pack from Whittards” form and, I suspect, they aren’t using the finest beans for such products. 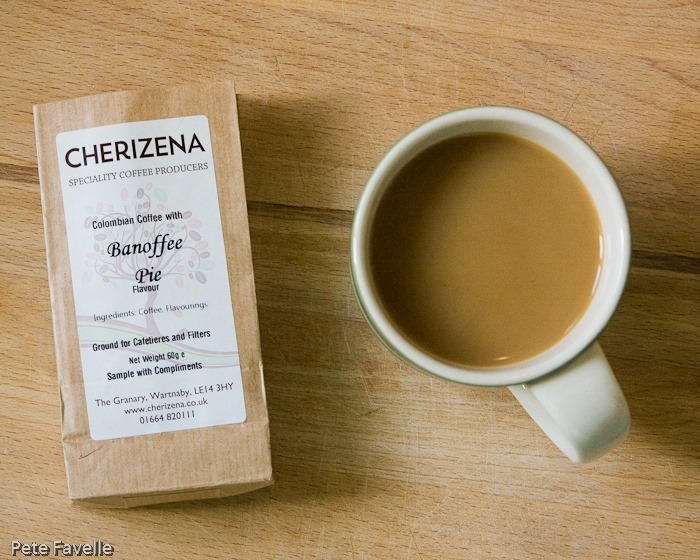 Cherizena Banoffee Pie flavour coffee may be a different story. They produce some pretty decent regular coffee, and use their standard Colombian beans as a base for all their flavoured options. The question is, is it good enough to convert me? The aroma of the grounds is overwhelmingly banana – proper, overripe banana fruit rather than the artificial “banana flavour” I was expecting. Beneath the fruit is a touch of caramel and just a suggestion of dark chocolate. Brewed, the fruit still comes through strongly but is less overwhelming, and the caramel is more pronounced. The level and accuracy of the aroma is impressive – from the other side of my (admittedly small) kitchen, it smells very much like there’s a banoffee pie in here with me. In the mouth, there’s an initial slightly acidic bitterness that is more coffee than pie. Almost immediately, though, this is joined and then overwhelmed by caramel, banana fruit and a subtle sweetness. That bitterness comes back gently in the finish, which helps to keep the sweet flavours becoming too much. Overall, I’m impressed – both by the balance between the base coffee and the added flavour, and by how close it smells and tastes to a good, gooey, caramel-filled banoffee pie. While not something I’d drink every day, it’s by far the best flavoured coffee I’ve tasted – 3.5 stars. 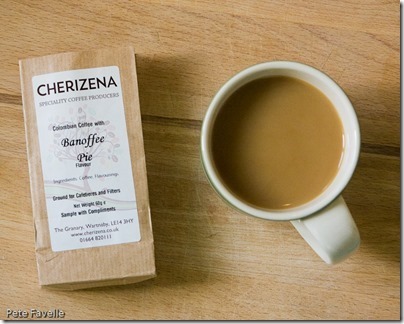 Many thanks to Cherizena Coffee for this sample.